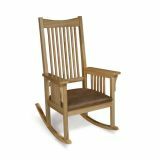 The complete wood frame ensures durability to this traditional style chair, while the microfiber seat offers lasting comfort. Taupe cushion is durable and cleans easily. Natural, non-toxic finish. Meets all CPSIA safety standards, CFR 1633 flammability standards and JPMA certified. 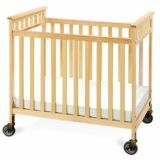 Solid wood, contemporary design folding crib offers an extra sleep spot or additional play area when not needed. This crib and mattress store away, safe and clean, no need or disassemble. No evacuation frame necessary, now every crib can be the safest crib! 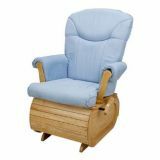 40.02"L x 25.85"W x 37.42"H. Folded dimensions are approximately 40"L x 10"W.
Glider offers comfort and protection and features 21" seating for full capacity for comfort and extra space; durable "stop lock" feature to ensure the safest environment at all times; all-sealed, ball bearing mechanism for increased durability and smoothness; beautiful, non-toxic finish on our finish on solid wood construction. Meets all CPSIA safety standards and JPMA certified and CFR 1633 Flammability standards. 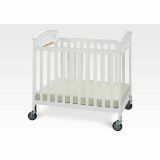 Scottsdale Compact Size Crib, Natural Finish, Casters & 3" Foam Mattress Included, 24" x 38". 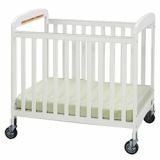 Innovating engineering provides superior strength for this highly designed crib system. 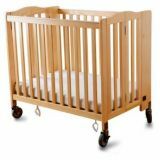 All fixed sides with a metal box frame provide center support for daily use and strength and durability when used as an emergency evacuation crib. 38.97"L x 26.09"W x 41.12"H.